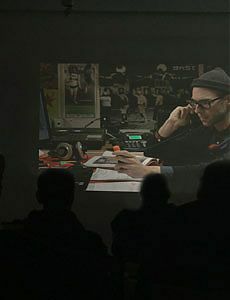 Improper Names consisted of two screening events of the documentary My name is Janez Janša at the NeMe Arts Centre. A name. Everybody has one. In the documentary, individuals, artists and academics from all over the world share their thoughts about the meaning and purpose of one’s name from both private and public perspectives. The problem of homonymy and other reasons for changing one’s name are explored as the film draws references from history, popular culture and individual experiences, leading us to the case of a name change that caused a stir in the small country of Slovenia and beyond. In 2007, three artists joined the conservative Slovenian Democratic Party (SDS) and officially changed their names to that of the leader of the party, the Prime Minister of Slovenia, Janez Janša. While they renamed themselves for personal reasons, the boundaries between their lives and their art began to merge in numerous and unforeseen ways. Signified as an artistic gesture, this particular name change provoked a wide range of interpretations in art circles both in Slovenia and abroad, as well as among publicists and the general public. Janez Janša (1970) is a conceptual artist, performer and producer. His work has a strong social connotation and is characterised by an inter-media approach. He is co-founder and director of Aksioma – Institute for Contemporary Art, Ljubljana. Aksioma – Institute for Contemporary Art, Ljubljana, is a non-profit cultural institution based in Ljubljana, Slovenia. The basic activities of Aksioma are the production, promotion and distribution of new media art projects. However, its program also encompasses the fields of performance and visual arts, music, documentary and video production as well as education and publishing. The documentary features a great deal of internationally known names, among them UBERMORGEN.COM, Vuk &Cacute;osi&cacute;, Franco and Eva Mattes, Jan Fabre, Stephen Kovats, Tim Etchells, Vaginal Davis, Mladen Dolar, and, last but not least… Janez Janša, Janez Janša and Janez Janša. I have dealt with these and many other questions in numerous lectures/presentations at various universities and museums around the world. On these occasions, I started discovering dramaturgical possibilities of the story that I was telling and constantly reshaping, amending with regard to the audiences’ responses. The draft for the script of the film My Name Is Janez Janša was thus the result of a series of direct interactions with the audience. The theatrical piece “The more of us there are, faster we’ll reach our goal” served as a study for the script as well. We would very much like you to watch this Aksioma produced video, presenting the documentary "My name is Janez Janša" uploaded on Vimeo on vimeo.com/46937250.